A valuable resource for any organizational development professional, OD Network’s exclusive Organization Development Review (formerly the OD Practitioner) arms you with valuable industry trends and insights featuring leaders and members of our association and beyond. This quarterly journal combines theory and practice to ensure that your clients get the benefit of your expertise, backed by the latest peer-reviewed research. With over ten years of archives, you’ll always have industry news, best practices, and information—right at your fingertips. Access Back Issues. Access to the Organization Development Review is a benefit for all OD Network members. Non-members and libraries may also subscribe to the journal for just $90 per year. To celebrate 50 years and the journal's new name, we are offering you the opportunity get FREE access to the 2019 issues of Organization Development Review. Sign up today and we'll provide access to the current issue and notify you when new issues are published through 2019. Learn more about all the benefits of OD Network membership and join today. 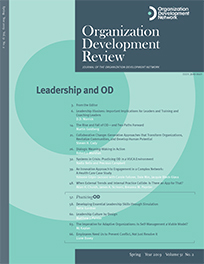 Subscribe to Organization Development Review. The purpose of the Organization Development Review is to foster critical reflection on OD theory and practice and to share applied research, innovative approaches, evidence based practices, and new developments in the OD field. We welcome articles by authors who are OD practitioners, clients of OD processes, Human Resource staff who have partnered with OD practitioners or are practicing OD, and academics who teach OD theory and practice. As part of our commitment to ensure all OD Network programs and activities expand the culture of inclusion, we encourage submissions from authors who represent diversity of race, gender, sexual orientation, religious/spiritual practice, economic class, education, nationality, experience, opinion, and viewpoint.